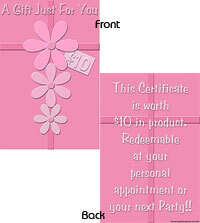 A Gift Just For You $10 Card. 50 cards per pkg. Each card is 4 x 6 inches and printed on heavy gloss card stock. These fit very nicely in our 5 x 8 inch cellophane bags!